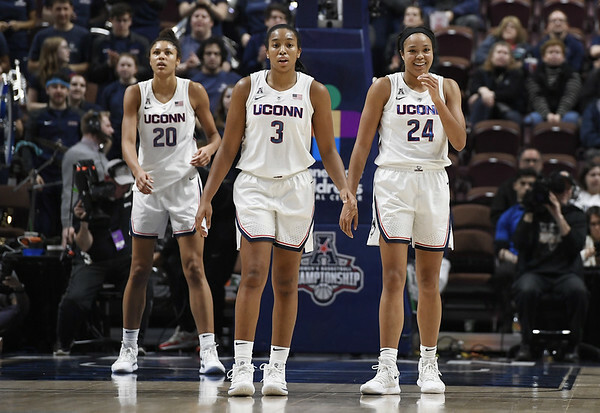 STORRS - UConn comes into this year's NCAA Tournament feeling a little disrespected and that could be bad news for the rest of the field. The Huskies (31-2), who have been to 11 consecutive Final Fours, open play Friday evening in the Albany Region as a No. 2 seed against No. 15 seed Towson. The Huskies expected to be the region's top seed with a No. 2 ranking in the polls, four wins over top-25 teams and losses only to top-five opponents Baylor and Louisville on the road. Coach Geno Auriemma notes that his teams have lost in the NCAA Tournament when they were a top seed and have won the national championship when they were not. Being seeded second rather than first, means little more than having to pack both white and blue jerseys if they make it to Albany, where they could meet No. 1 seeded Louisville again. Friday's game will mark the return for UConn of All-American Katie Lou Samuelson, who sat out the Huskies regular-season finale and the entire American Athletic Conference Tournament with a back injury. Auriemma said the senior's shooting form has returned, but she not back to full mobility. He said he never considered sitting Samuelson, who is averaging just under 19 points per game, in the first round. No. 7 seed Rutgers will face No. 10 seed Buffalo without Hall of Fame coach Vivian Stringer, who has not coached since late February because of an undisclosed illness. Stringer, 71, is in her 24th year at Rutgers and 48th season of coaching. Timothy Eatman, who has been serving as acting head coach. He filled the same role in 2016, when Stringer missed three games to care for and later mourn her mother. “It's always hard when your head coach isn't around, but we have a great coaching staff and supporting staff,” Rutgers senior forward Stasha Carey said. "Coach Eatman knows what he's doing. He's been doing it pretty well the past couple games. Buffalo's men's and women's teams will be playing at the same time. The women face Rutgers at 4:30 p.m. The men tip at 4 p.m. in Tulsa against Arizona State. Towson (20-12) had its first winning season since 2011-12, and had its most wins since 2007-08. The Tigers played just one ranked team this season, falling to Syracuse in December, 98-55. Posted in Newington Town Crier, UConn on Thursday, 21 March 2019 20:21. Updated: Thursday, 21 March 2019 20:23.